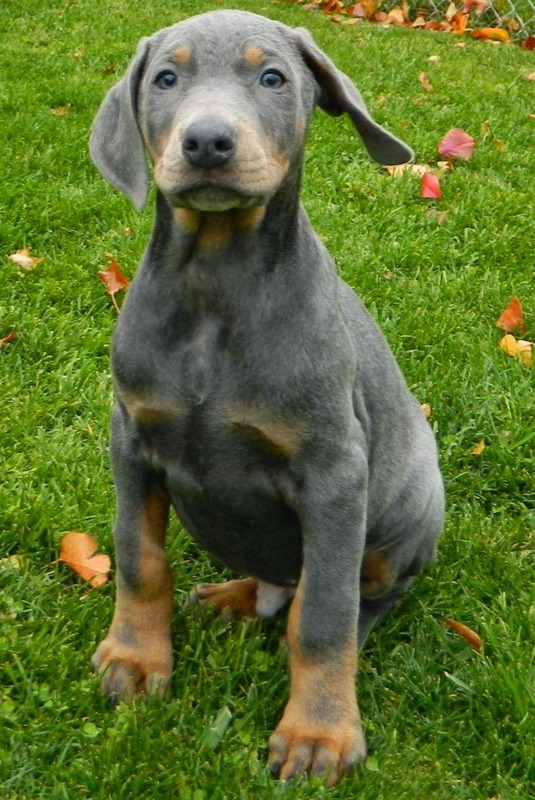 He is a blue doberman rescue pup from a shelter up in the Toledo area. Aaron and I had been toying around with the idea of getting another dog - mainly for Deedee to have a companion. She is such a sweetheart and I hate that she spends so much time home alone during the weeks while we both work, Aaron travels, and I'm in school. 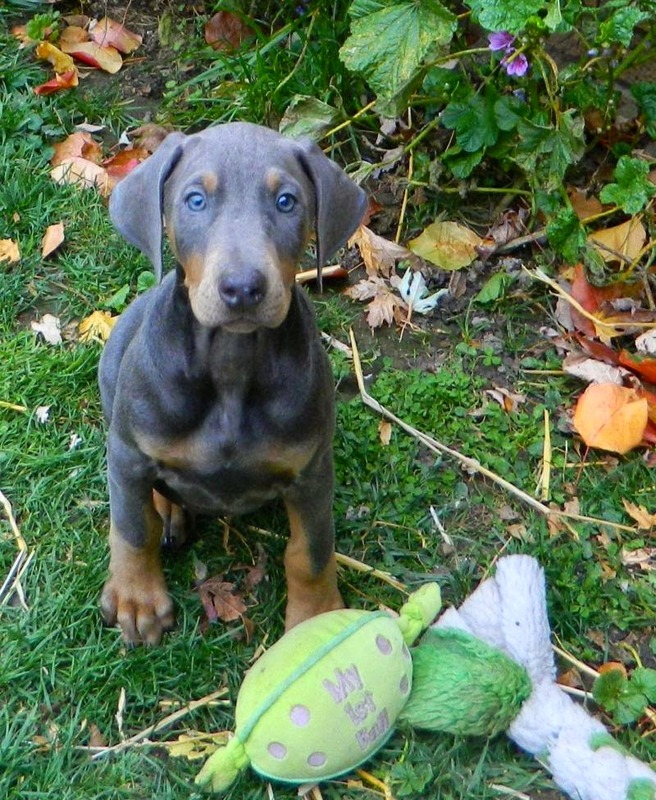 We love dobermans, but it is hard to find them as rescues, and I really didn't want to buy one from the pet store...so I have just been frequently checking pet finder to see if any thing popped up. I think I probably squealed :) He looked so perfect and was only a 2.5 hour drive away! I sent the link to Aaron to check out, and we emailed them right away with an adoption application. Saturday morning, we got the call that they loved our application and we could come get him as soon as possible! It all happened so fast, but now he his home safe with us. He is a sweetheart, so affectionate and such a snuggler! He loves to climb up into our laps and curl up, rest his head on our shoulders, or just be held. I can already tell this is going to be a completely different experience than with Deedee though...she is a very timid and anxious dog (has been from the second we met her) so she wasn't too mischievous in the house as a puppy (and still isn't today). But this little dude isn't timid at all! He's rambunctious and curious - already loves to romp in the leaves outside and chase Deedee around. Speaking of which, if anyone has some tips on how to acclimate a new puppy into the house that already has a dog, I would appreciate it! They are okay so far, but Deedee gets too excited and tries to play with him as if he was much bigger - so we have to watch like a hawk because we are worried she'll pounce and hurt him. She's not being mean at all, just trying to play too rough like she would with a dog her size. Any suggestions are much appreciated! Puppies are a handful! But I'm so excited to have Dex in our family and looking forward to him and Deeds becoming best friends. Congratulations on your new baby!!! He is gorgeous! I've been wanting another dog for awhile too...I just don't know if it's a good idea quite yet. I think Jamo would love a friend though. I'm so glad you rescued little Dexter, keep the pictures coming! Oh my goodness - congrats girl!! He is absolutely adorable and I love the name you gave him!! EEEEEEEEEEEEEEEEEKKKKKKKKKK! I just love this! He's gorgeous!!! I think this will cure your baby fever for a little while! Lol! We've found that Jack is like that with smaller dogs and it always makes me nervous too... sometimes the older one just doesn't know their strength/size compared to the little pup.